Chris Froome (Team Sky) claimed the first stage race victory of his professional career as he crossed the line mid-bunch at the end of the final stage of the Tour of Oman. 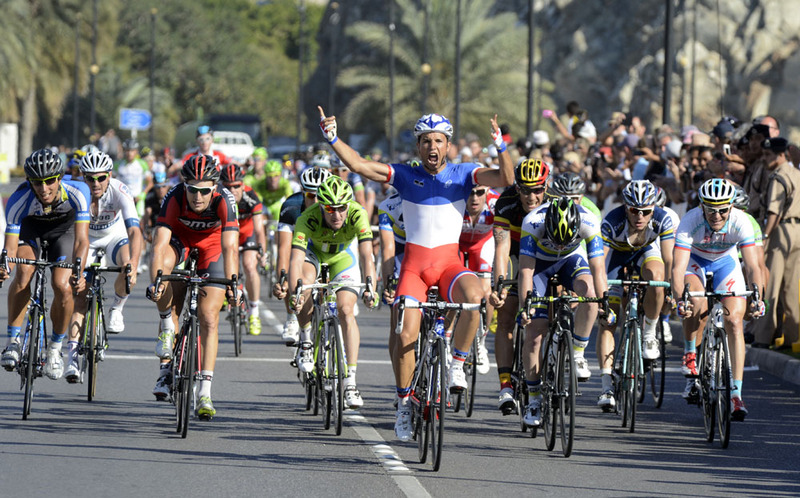 Nacer Bouhanni (FDJ) won the 144km stage from Hawit Nagam Park to Matrah Corniche in a bunch sprint ahead of Matt Goss (Orica-GreenEdge) and Taylor Phinney (BMC). On the steps alongside Froome on the final podium were two former Tour de France winners, Alberto Contador (Saxo-Tinkoff) and Cadel Evans (BMC). “That was quite a special feeling,” he said. “It hasn’t quite sunk in yet that this is my first ever stage race win. “Any victory over the riders that are here – Contador, Evans or [Vincenzo] Nibali – is a huge victory. I’m really happy with this. I know I’ve got new responsibilities and a new role in the team. After two tough stages, finishing at Green Mountain on Thursday and with an all-out assault by Contador on Friday, the final stage was relatively straightforward for Team Sky, who marshalled Froome on the high speed finishing circuits of the Corniche. “I had an armchair ride to the finish during the last stage,” said Froome. “With the finishing circuit having a little bit of a climb on it, I was worried about something going wrong with the bike or a crash in front of me. “The main thing was to stay at the front and out of trouble. The team took it up on the final circuits and lifted the pace, giving me a smooth ride in. Brad [Wiggins] did some massive pulls and everyone did their part. It was fantastic.